Product #17671 | SKU SAXP106W | 0.0 (no ratings yet) Thanks for your rating! 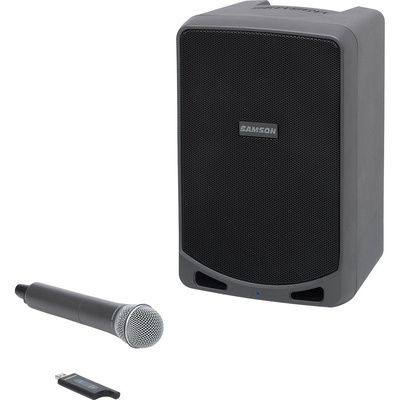 The Expedition XP106w Portable PA System from Samson is a single-speaker PA system that includes Samson's XPD1 USB digital wireless system, for wireless handheld microphone applications. It is capable of up to 100 watts of power output and is powered by a Class D amplifier. The XP106w supports Bluetooth streaming audio and features a variety of other input options including a combo XLR/TRS mic/instrument input, a 1/4" line input, a 1/8" MP3 player input, and a USB port for compatibility with Samson's XPD1 USB digital wireless system. The built-in rechargeable battery provides up to 20 hours of operation per charge. Fit for fitness applications, the XP106w can easily provide the power and performance needed to run small yoga classes and dance studios. The XP106w can also be used in front of higher intensity exercise methods, including outdoor aerobics, Zumba, and CrossFit. Use the Bluetooth or 1/8" stereo Aux (MP3 player) channels to engage your favorite workout playlists or pick up the mic to provide your class with words of encouragement and motivation.